Four days after I was done with school this year, I needed to start packing a child's lunch again. This was for an 18-year-old, mind you, but I was happy to help as she had long days ahead of her with 4- and 5-year-old's in a camp setting. and that days around here would be just a little quieter with her gone til dinnertime. After packing her lunch for a few weeks, she asked me to write her name and the name of her group on the front of the bag because it all got thrown in a bin when she got to camp according to age division. So I wrote "Lauren...Cubs...." and then I just couldn't stop myself as my pen went further down the bag and drew a big smiley face on the front. There. That looked better now. When she came out to pick up her sack, she looked at the bag with a questioning smile and said, "What is THAT?" Without answering, I just threw a big ol' smiley face on me, turned her to the front door and sent her out. Days passed. Lunches were packed. I experimented with every stick figure and form of a smiley face that I knew how to draw. And each day she'd turn the bag around on the counter to see what creation I had affixed front and center to her bag that day. And usually I got the same slightly off grin that said, "Ok Mom, I get it...you love me....". Just the other day she picked up yet another lunch from the kitchen on her way to camp. She stopped for a moment and said, "You know Mom, all my friends really like that you put a smiley face on the front. They think it's neat." Inwardly I heard her finish the sentence with, "And so do I." This is the stuff summer afternoons are made of. Hope you're having a great one! I write this at the end of an almost picture perfect summer day. The weather was ideal, the sky was an irridescent blue that you only get once in a while, and the word "humidity" wasn't in anyone's vocabulary. It was a day just to putter. Run errands. Pick up a car. Get a haircut. One of those leisurely I-don't-have-to-be-anywhere-at-anytime-in-particular kind of days. The pool was opened last night (after some patch and repair work), so we sat ourselves in the sun this afternoon and I watched my two grown and growing sons hang out in the water together while I retrieved items that escaped the pool's edge. I soaked up rays of sunshine that seemed to infuse my very self with so much natural light that it was invigorating. We marched fresh laundry from the clothesline into the house, felt the breeze from the open windows on our faces, and chased after our Golden as she escaped out the door many a time. At one point mid-afternoon I stepped out the front door into the sunlight, drew a long deep breath, and just stood there in order to recount all the minutiae of the day that made it such a great one in sum total. These are days to bottle and keep, I thought to myself. And that being an impossibility, I went and did the next best thing I could. I blogged. This is how I start my day. And this is by far my current favorite mug. 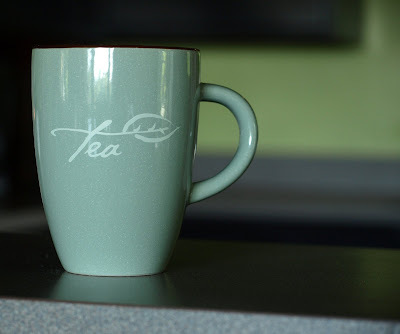 I love the color, I love tea, and I absolutely adore the sentiment on the back. This summer I've come to cherish cool, breezy mornings in our patio room with a cup of tea and some quiet time as my favorite part of the day. The peaceful early hours....to hear the birds sing, see the freshness of a new 24 hours begin, and think of the promise that the day holds. ...but no matter where I end up, it seems that this room and morning go perfect with a cup of tea.